Date night at Bruno's Little Italy in Little Rock. I’m not sure why, but when romance is in the air it usually involves Italian food in the belly. I wholly contribute this to seeing Lady and the Tramp as a child; there are many cuisines out there that are just as romantic. Still, finding ourselves with a rare child-free date night, the hubster and I found ourselves on the doorstep of Bruno’s Little Italy for dinner Saturday night. Well, it is one of the best places to soak up some Sinatra-and-Co. music-laden air, as well as some thick red meaty sauce with white bread. We were seated in the window at our request, just as the sun was preparing to set over Bowman Curve. The windows were polarized behind the curtains, leaving a light glow echoed by the small flickering candles on each table. On each of those tables was a bottle of wine, a candle and various shakers. 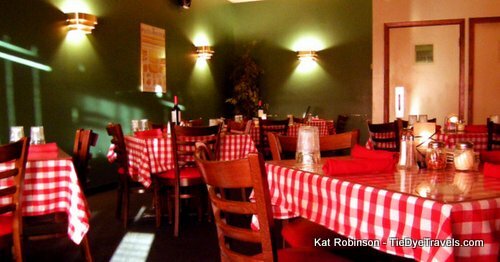 The walls were green with posters here and there; tables were topped with red and white checkered tablecloths. Our section was vacant when we arrived, the perfect little corner to enjoy a quiet meal together. Bread was delivered to the table for us to consume while we were debating over what to order. Like most Arkansas-based Italian restaurants, butter was served with the bread, a small crusty loaf that could be cut with a knife. 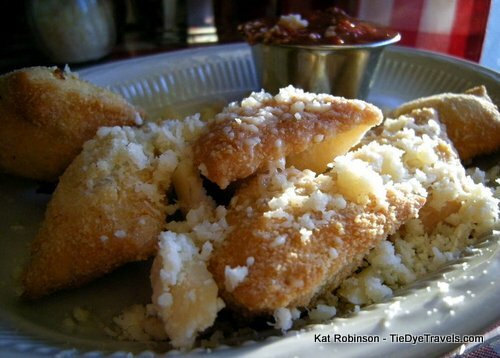 We started off our meal with the Toasted Ravioli ala Lauren Weintraub ($7.95). These hand-made raviolis are a bit irregular, but they are stuffed with a blend of ricotta, parmesan and I believe provolone cheese with a little spinach and Italian spices. 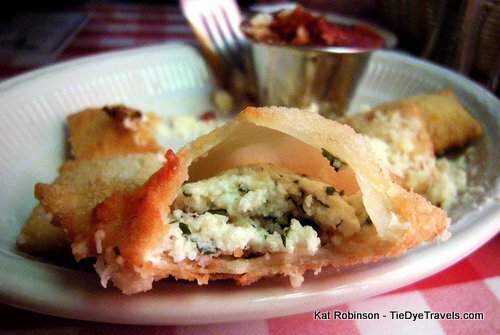 These pockets of joy are very crisp on the outside but firm and packed with cheese inside. They’re served up with your choice of the house marinara or meat sauce — both are excellent, very mature of flavor. It was about the best thing I’d eaten all month. Our entrees were equally appetizing. Paul went for the Ravioli Sorrento ($14.95), more cheese stuffed ravioli under a choice of marinara, meat or mushroom sauce covered in mozzarella and baked. Paul went for the meat sauce. The raviolis in the dish were much larger than the ones in the appetizer — one seemed to be nearly four inches square, all irregular in the way only handmade pasta can truly be. Baked, the raviolis achieved their classic texture. 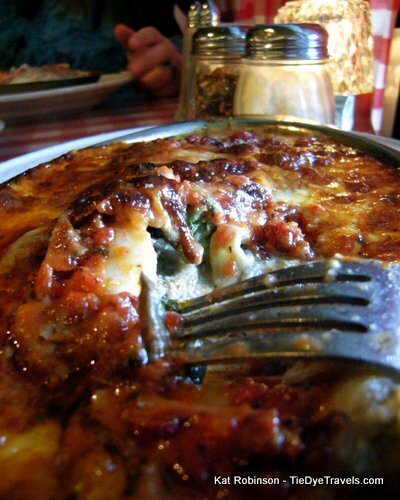 I chose the Vegetable Manicotti ($14.95), a melange of all sorts of vegetables wrapped in pasta sheets and baked. 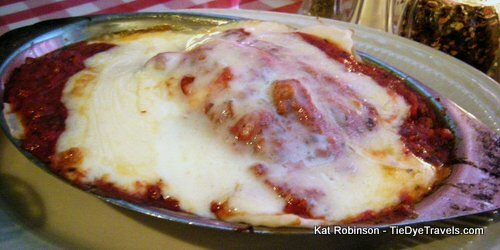 I asked my server about the sauces, and though my husband thought it was a little odd I had my manicotti baked with meat sauce. I’m not vegetarian but I love vegetables, and our waitress told us lots of people ordered the dish that way. 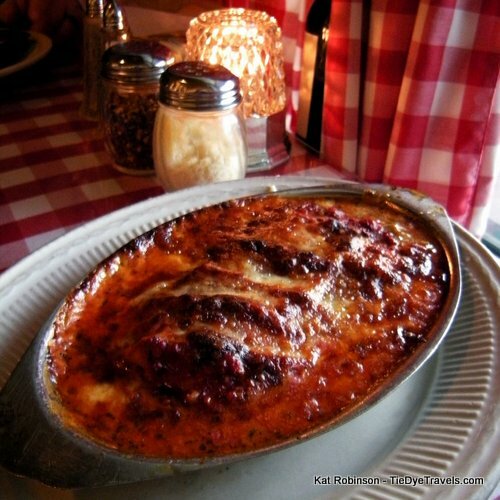 The manicotti came to the table in a bubbling stew of hot meat sauce. Underneath, I found small cut vegetables tucked in with the cheeses in the manicotti rolls themselves, lots of broccoli and zucchini and peppers along with spinach and squash and eggplant. I found myself reaching for the bread to sop up the generous sauce, thought I didn’t think to grab some Parmesan until I was about done. It was hot, it was filling, and I didn’t feel guilty about it. Better than a V8. We had a little time before we needed to head off to the movies, so we decided to split a dessert. I gave Paul no choice — though I knew he would want something chocolate-y, it had been a long time since I’d had Zabaglione ($6.50). I wanted that warm sweet creamy beverage, and Bruno‘s really delivered. The careful balance of sugar, cream, eggs and amaretto is heated and served with ladyfingers. It’s rich — I’ll give you that. It’s decadent. If I had two of these by myself I wouldn’t be safe to drive. I want another right now. We don’t eat out quite so extravagantly on a regular basis, and it’s rare these days to get a date night where we can enjoy a good Italian meal. For what we were looking for, we got a nice romantic meal and a spectacular dessert in an hour and a half and made it to the movie on time. Can’t beat that. 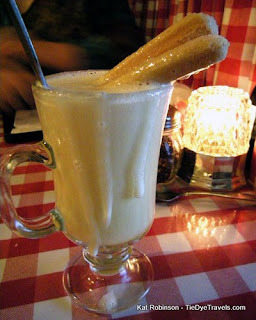 Those toasted raviolis and the zabaglione were so good, I’ve declared them the best thing I ate in the month of October. No joke. Want to experience it? You have to wait til dinner. 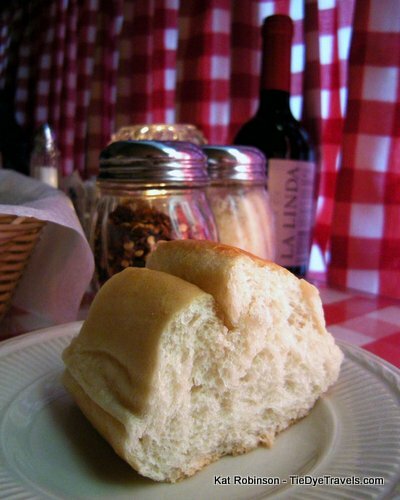 Bruno’s Little Italy is only open 5-10 p.m. Monday through Saturday. The menu and more on the website, or you can call (501) 224-4700. UPDATE: Bruno's Little Italy has moved downtown to 310 Main Street. Check out the new website or call (501) 372-7866.